Would you like a house with that? Special editions of games keep becoming more lavish, more ostentatious and as a result, more expensive. Oftentimes, they border on the ridiculous. They’ve now quite convincingly jumped the shark. 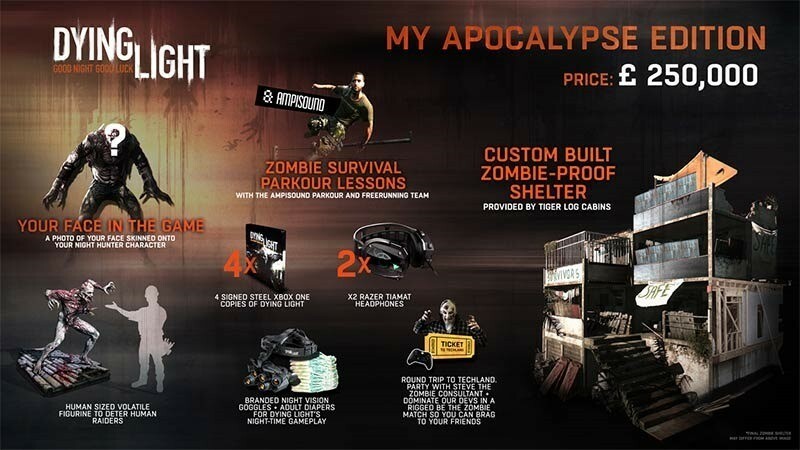 The latest, very limited edition of the physical edition of Dying Light costs a disconcerting £250,000. At current exchange rates, this extremely limited edition of the game would cost you R 4,442,120. Yes, that’s nearly four and a half million Rand. I think. I’m not good with numbers. It’s available exclusively from the UK’s GAME, and is called My Apocalypse. Why on earth does it cost so much? For starters, it comes with a house. Yes, an actual house – but not just any house. Rather it’s one that’s been specifically made to be zombie proof. Yes, really. The house in question is “fortified zombie apocalypse-proofed” and will be built to order by UK company Tiger Log Cabins. The house will feature an upper deck, an escape hatch, arsenal storage for weaponry, and a living area with TV, Xbox One, and a banging sound system. It also comes with Parkour lessons, survival guidance from an expert, and a trip to Poland to meet the game’s developers. Oh, and four copies of the game so you feel like you’re getting your money’s worth. That sounds like it’s worth 250 thousand squids to you?